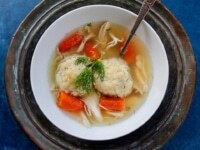 Matzo Ball Soup – My favorite homemade chicken soup with three matzo ball recipes – floaters, sinkers, or gluten free. This is the way I make chicken soup for my family. The recipe produces a rich, flavorful broth that is just right for serving with matzo balls (or egg noodles, or rice, or veggies). I’ve linked to three of my favorite matzo ball recipes below. It can be used as a simple chicken stock base, which can then be dressed up into soup. Or, you can use the broth in different recipes that call for the addition of stock. It is My Favorite Chicken Soup… aka, Jewish Penicillin, the soup that can cure anything. Let me start by saying that everybody has their own way of making chicken soup. 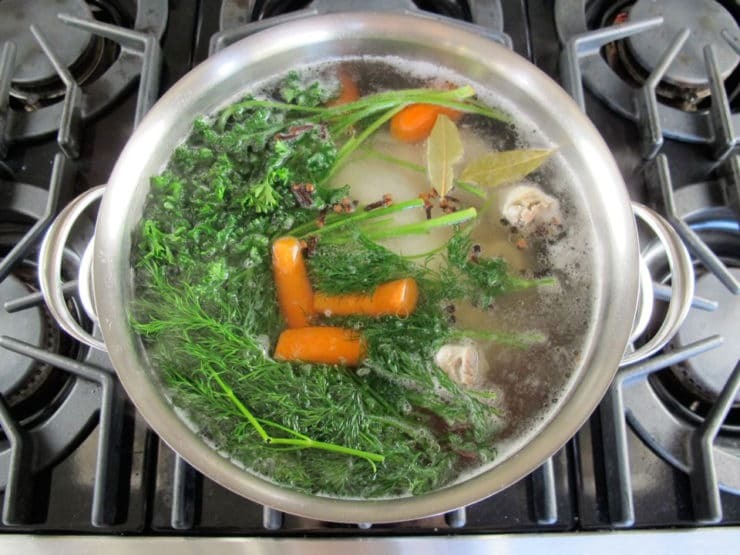 Making stock is a simple concept and recipes abound, along with opinions on which way is the best way. I don’t pretend that one is better than another. This way just happens to be my family’s favorite. Feel free to dress it up the way you like it– add a parsnip for sweetness, half an onion or thyme for a rustic flavor, or garlic for depth. Use your imagination, or your bubbe’s favorite ingredients. Play around till the flavor is right for you! On its own, chicken soup is gluten free and very healthy– a great source of protein, with healing qualities. It helps to clear your sinuses and warm you from the inside. From the basic soup recipe, a starch of your choice can be added– rice, egg noodles, kreplach, or veggies like squash, zucchini, and potatoes. 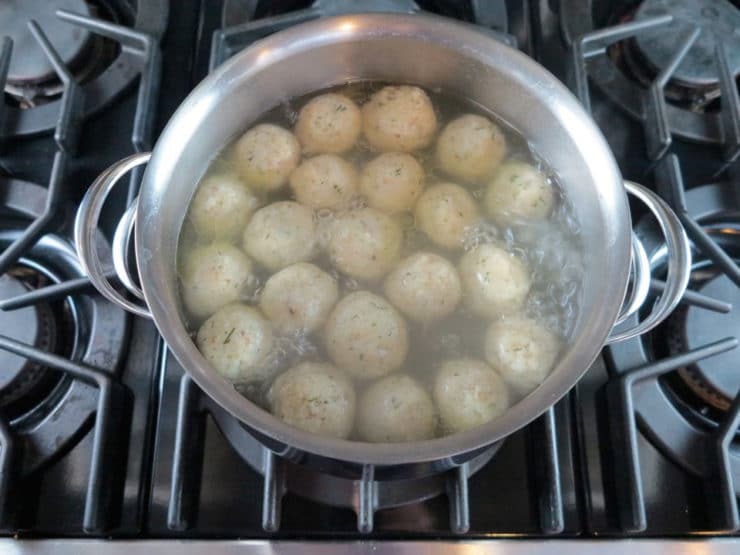 During Passover, matzo balls are the traditional and kosher starch of choice for the holiday (they also happen to be my favorite choice year-round). When it comes to matzo balls, everybody has their own way of doing things. Some like their matzo balls light as a feather (floaters), whiles others prefer them with a more dense, thick texture (sinkers). Both are delicious in their own way. Then, there are always opinions on which herbs and spices to add to the mix, and which oil to use for binding the matzo. Oh, the options! My method for making matzo balls is pretty simple. I used to use Manischewitz mix, which I still think is a great option, but I’ve learned over the years that it’s just as easy– and cheaper– to make your own from scratch. Making your own mix allows you more control over the flavor and texture of the matzo balls. 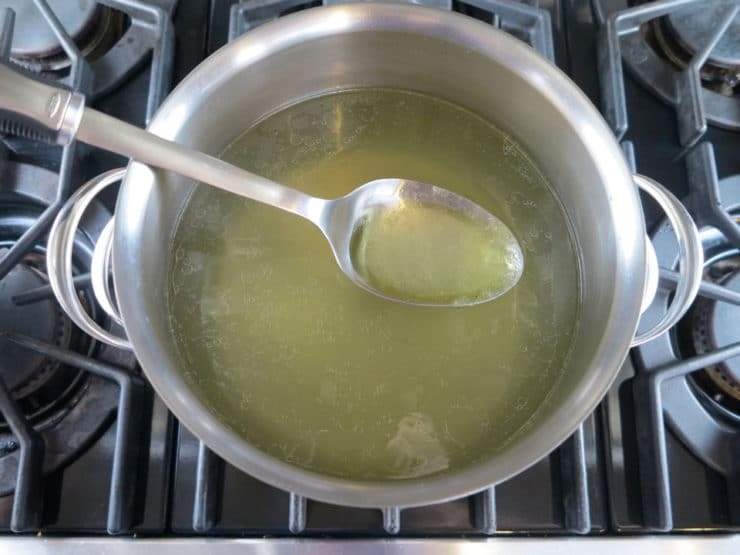 I use a few spices, fresh dill, and melted schmaltz to bind the batter (you can use oil if chicken fat freaks out your cardiologist– but I love the flavor of schmaltz). Once in a while I change things up, depending on what texture or flavor I’m going for. 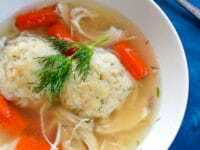 To check out my matzo ball recipes, click the links below. I’ve also included my Gluten Free matzo ball recipe for those who can’t stomach the matzo; it’s potato based, and really delish. Of course, if you’re not a matzo ball fan, feel free to make this soup into something completely original by adding your favorite ingredients. The possibilities are endless! And if you are a fan of matzo balls, comment me and let me know what your favorite type is. Are you a floater, or a sinker? 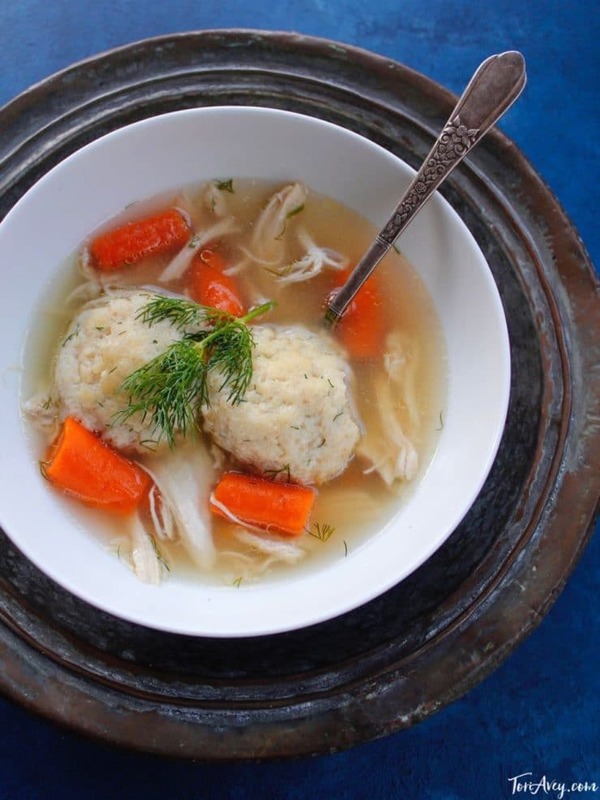 Recipe for chicken soup, aka Jewish Penicillin, with links to 3 different matzo ball recipes (including gluten free!). Kosher for Passover. 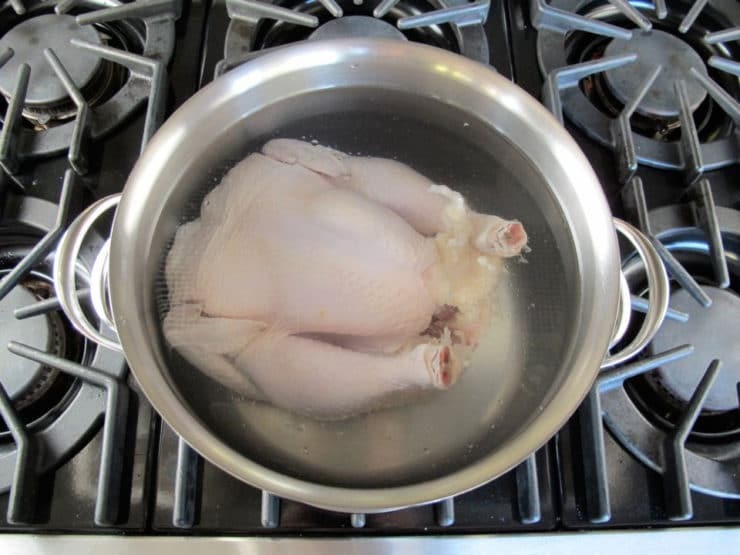 Place the chicken into a large stock pot. Cover with 4 quarts of water. Bring water to a boil over medium high heat. 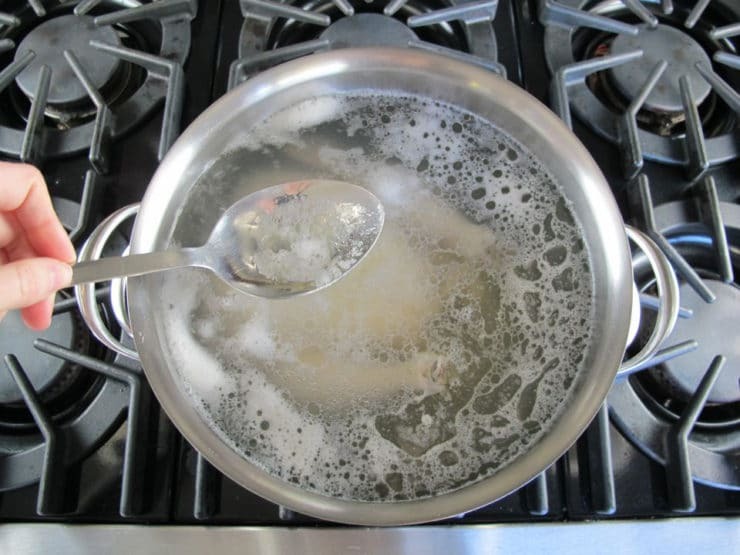 Let the chicken boil for 10-15 minutes, skimming the foam and particles that rise to the surface of the water periodically, till most of the foam is gone. Replenish the liquid that was removed during scumming with hot water (it's usually around 1-2 cups). Do a final skimming to remove any leftover foam. Add the carrots, celery, onion, parsley, dill, peppercorns, and cloves to the pot. Add 1 tbsp kosher salt to the water (if you're salt sensitive or using a kosher salted bird, salt less). Bring back to a simmer. Put the lid on the pot and vent it. Reduce heat to medium low so the soup is slowly simmering (not boiling- a rolling boil will make the stock cloudy, a slow simmer should do it. Let the soup cook for 90 minutes. After 90 minutes of cooking, when the chicken is tender, turn off the heat. Use a pair of tongs to carefully pull the chicken from the broth. Put it on a plate. Taste the chicken broth and season with additional salt, if desired. Allow the chicken and the broth to cool. Carefully strain the broth into another pot through a mesh strainer. Reserve the cooked carrots and celery for later, if you wish; discard the spices, herbs, and onion halves. When the soup is completely cool, you can skim the fat from the top of the broth if you want to-- it will come off in a gel-like layer. I actually don't like to skim the fat, especially for holidays; a few droplets on the surface make the broth silky and give it flavor. If you are adding the saffron, crush the threads into powder, then stir them into the broth. Saffron adds a depth of flavor and a deep golden color to the broth. It's got a distinctive essence, so don't add it unless you're sure you like it. Pull the meat from the chicken bones into bite-sized pieces. 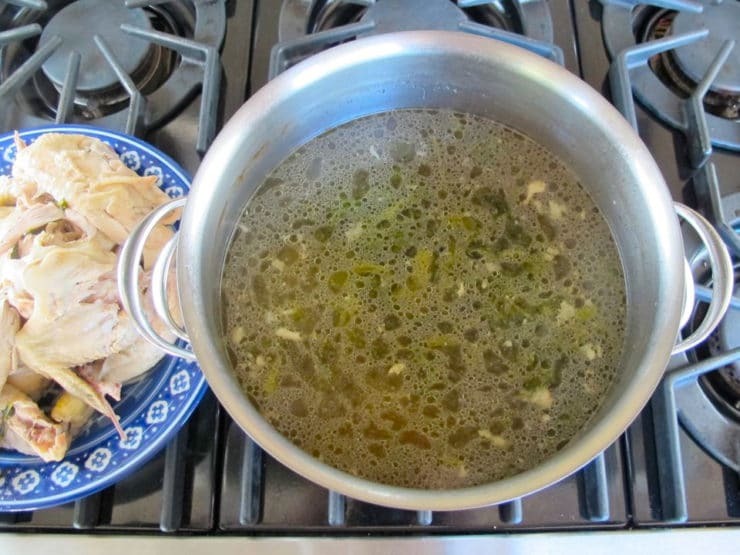 If you are cooking something in your broth, like matzo balls or kreplach, bring the broth to a boil and cook them in the broth before adding back in the reserved vegetables or chicken pieces. Do a final tasting and adjust seasoning, adding more salt to taste if desired. Some people prefer to cook their matzo balls in salted water in a separate pot, because a lot of the soup gets soaked up by the matzo balls. Personally I prefer cooking the matzo balls in the soup, as they turn out more flavorful this way. That said, if you're feeding a big crowd and need to stretch your soup, cooking the matzo balls in salted water (or another pot of broth) is the way to go. Add the cooked vegetables and/or chicken pieces back to the broth at the very end, for the last few minutes of cooking, until warmed through. Serve hot. Sometimes I add a little more chopped fresh dill to the broth before serving. I love dill. (although I find much of great interest in Judaism, and have read quite a lot ), and somewhere in my brain I remembered hearing of Jewish Penicillin. This was easy to make, and very delicious. The whole family tucked in, and the potful went in one sitting. I added leeks from the garden, as we have so many, and I don’t think it spoilt anything. I am a reluctant cook, at best, but this has inspired me to be a bit more adventurous with different recipes from different cultures. My future daughter in law is gluten free so has never tasted kneidlach! What is the almond you talk about please and if I can’t find red potatoes is there an alternative? Almond meal is also known as almond flour, it can be found in most health food stores or specialty grocers. Red potatoes are ideal because they don’t disintegrate in the boiling water as fast, so I really recommend them if you can find them. Yukon Gold would be the only other ones I would try here. I have made this soup several times now, most recently for Rosh Hashana for my extremely picky family. I am far from the best cook in the family (really, really far tbh) and each time I make this recipe it gets RAVE reviews–even the matzoh balls! This past time I made it my uncle said it was perfection–just like my grandma’s! I am convinced my son’s love of this soup is what gave him the final motivation to get through his bar mitzvah studies….it truly is magic. I am a single working mom without a ton of time to cook and while there i a bit of prep work on the front and back end, it is pretty easy. Trust me, If I can do it, this recipe is foolproof! Thank you for all the help, I’ve never had compliments like this before! What a fantastic recipe and I couldn’t agree more. Chicken soup has more varieties and opinions than just about any other recipe. It took me years to finally zero in on what I can now call my own version of an “original” recipe. I never would have thought to add cloves but will definitely try it with my next batch. Three questions I have after reading this recipe and post. 1) Why the separate boiling and skimming of the chicken before adding everything else? I have never seen this approach before and I’m wondering why it’s done and if I need to add that step to my own recipe. 2) How do I keep my vegetables from becoming absolutely soggy? I see yours and they look delicious added to the soup where mine never fail to be mushy and my celery winds up looking completely inedible. 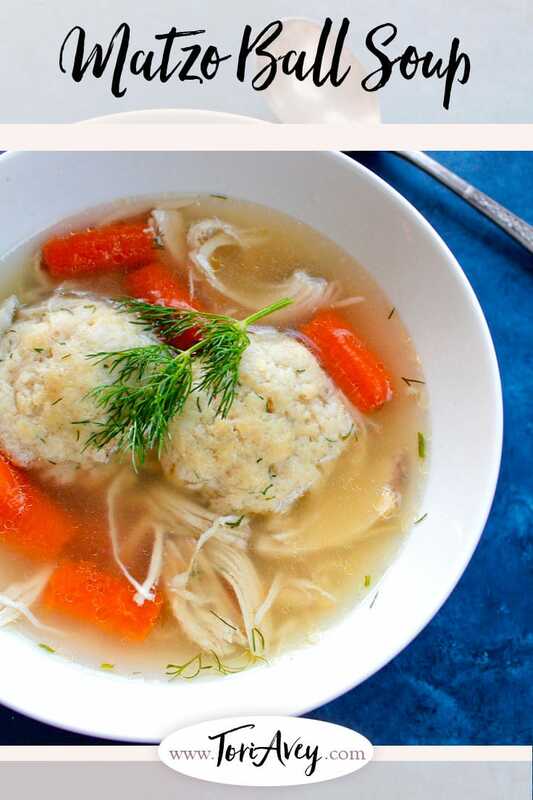 3) I see the matzo balls can be cooked right in the broth. Would that also be the same for the noodles or rice if I should decide to use those instead or in addition to the matzo balls? I always cook them in a separate pot of boiling water (probably because that’s how MY Bubbe did it) and wonder if I can cut out that step as well. I look forward to your thoughts on these questions and thank you for so many entertaining and inspiring posts. I stumbled upon your website looking for recipes for Passover many years ago and it’s been a go to for me ever since. Hi Richard, skimming is easier prior to adding the other ingredients. The scum can get caught in herbs and vegetables that float to the surface. The more scum you skim, the clearer your broth. For the veggies, you can remove them from the broth with the chicken. Then when you return the shredded chicken to the pot, you can add a batch of fresh veggies and cook those for another 20 minutes or so until tender. This will result in prettier vegetables and a more flavorful broth. It’s an extra step and most people don’t like discarding the original veggies, but it makes for a prettier more flavorful soup. If you cook anything in the broth (matzo balls, noodles, rice) it will soak up some of the broth, which reduces your serving sizes. On the flip side, whatever you add will be more flavorful when it’s cooked directly in the broth. I give more detail about this on the matzo ball recipes that are linked above. Basically, if you’re serving a big group and need a lot of servings it is best to cook separately. If you’re only making a small batch for family, cooking directly in the soup will yield more flavor. Of course, you need to add carefully – matzo balls and rice in particular are like sponges, and if you add too many you could end up soaking in all of your broth. Hope that helps! I want to share this tip…..while shopping for my soup ingredients at a local farm a woman suggested I use Celery Root and Parsley Root rather than just the leaves I had in my cart. Using your recipe as my guide I also added a pinch of cloves for the first time which was new for me and I added 2 zucchini in each pot for a little sweetness. The soup came out amazing and could possibly be the best I ever made. My husband is Israeli too and I look forward to trying one of your matzah ball recipe. Your blog and recipes were very easy to follow and I am glad I came across your blog. Thank you for this recipe. It came out delicious. My husband said it tasted just like his mother’s (that meant a 5 star approval for sure!). I really appreciate how your recipes are so clear and easy to follow and all of the commentary and suggestions you write along with the recipes (as well as the step-by-step pictures). Thank you- your website is one that I look at first when trying to find a recipe (I’ve made many but haven’t commented much at all so feel like it’s time I should!). I love the idea of this recipe it sounds delicious! I am embarrassed to admit I have no idea how to de-bone a chicken. My cooking to this point only involves boneless chicken… I feel like that will ruin this wonderful soup. So how do I debone (as completely and cleanly) as possible. My mother was a fan of all of everything that goes in the pot stays there and honestly blech!!! This is the first time I’ve found a recipe that makes me want to violate my no bones every! rule. Hi Milissa! First of all, don’t be embarrassed– we’ve all been there before, none of us were born knowing how to do things in the kitchen. 🙂 There is really no special technique from my standpoint. The chicken will be very tender after cooking for so long. Once it’s cool enough to touch, use your fingers and a fork or a small pair of tongs (I find tongs easier to work with) and start gently pulling pieces of meat from the bones. You’ll want to remove any skin from the meat, and check pieces for any small bones that might remain before adding them back to the pot. I hope that helps! i am a goy boy in new zealand and have been making this soup for a few years now. all my whanau (including 14 grandkids) call it grandpa john’s Jewish Penicillin. They all love it! Thank you Tori! Shalom. The best remedy ever, one is in my slow cooker now.The hungarian cooking is very healthy and beautiful!! This is good chicken soup recipe, but I totally disagree with onion skin. It makes soup looks black, I love clear yellow chicken soup and it is very easily achieved by not allowing soup to continue boiling on high heat. I lower heat as soon as it stats boiling. Didn’t try it with cloves, As much as I love cloves, I was making soup for my fiends for Passover and didn’t want to experiment. But I will ty it. Onion skin has never, ever made my broth look black. If you used a ton of onion skin then yes, it might change the color, but one halved onion shouldn’t cause any issues at all. It’s fine to remove the skin if you prefer. My daughter , Shana,rang me to tell me that my 15-year-old granddaughter, Kiearn, decided to do her first Seder (with her mother’s help) and I was delighted. They live on the Queensland Sunshine Coast and I couldn’t be there. When I asked how she made the soup I must say I was shocked when she mentiioned cloves. I’m 79 and my mother taught me how to make her chicken soup using our home-grown hens. After she took one to the rabbi to be slaughtered (we had no shochet where we lived) we went home and I helped de-feather it, clean it and put aside the giblets etc. and any eggs to put in the soup. Mum would sew up the neck and make helzel using her family recipe of flour, chicken schmaltz and onion. The soup would be simmered for about three hours and then she would make the matzo balls, sinkers and floaters to please her five daughters and our father. I highly recommend using a boiler or steamer, which I buy from the Chinese butcher who also sells feet, giblets and necks which all help make the soup extra delicious. The eggs (yolks) were reserved for my father. I still make my chicken soup the same way and, as I live on my own, share it with my neighbours. Hope this posting isn’t too long! Thank you Torey for your wonderful recipes. I’ve always believed that you can teach an old dog new tricks, although my soup recipe is sacrosanct! Your soup sounds amazing! Cloves give it a hint of warmth and a fabulous aroma. I picked up that tip from a Jacques Pepin/Julia Child cookbook years and years ago. I love this recipe and use it all the time. So happy to see that your recipes have made it to Australia. I am a newly transplanted New Yorker living in Tasmania. Heather can you tell me how to get my hands on Matzoh. I know some Coles stores in Victoria sell it but I haven’t seen any in Tassie. Do they sell it in Queensland? I loooooove all of your recipes!!! Thanks to you my 1st time cooking the Seder for my husband’s family was a huge hit, and this chicken soup with matzo balls was sensational! I also made your brisket and your noodle kugel. Everyone was raving and totally amazed because it was my first time, but your recipes are delicious and your directions are so easy to follow! Thank you a thousand times!!! You’re welcome Rose! So happy to hear it all worked out well for you. I made this recipe and it was fabulous! Did not strain the broth, and did not add saffron – it was wonderful on it’s own! I love reading your “his-stories” and making your winning recipes. Here’s a bit of my family’s history with chicken soup. My mother-in-law’s tradition was to serve the soup at the end of the Yom Tov meal so guests would eat the main course and not fill up on just soup. When I joined the family meals she would tell me that it was to “fill in the empty spaces in your stomach so you shouldn’t be hungry”! My father-in-law had many ailements as he aged, one being that he become severely bloated after eating chicken soup. Instead of no longer making her chicken soup, my smart monther-in-law started adding a few garlic cloves to the cooking of the soup and behold, it no longer caused bloating and discomfort to my father-in-law. My mother-in-law was not universtiy educated but was a brilliant lady. Eventhough she and her husband are not longer with us, I happily continue her tradition. I have to agree with you, Samuel. When my four sisters and I were children we emigrated from England to Australia in 1949. We kept chickens (hens) and mum would take one to the Rabbi (we had no shochet) to be slaughtered. Back at home we would pluck it, clean it and put aside the giblets, feet, neck etc. to cook with the soup. My grandmother always called it ‘gildern (golden) soup because of the globules of golden fat floating on the top. The flavour was indescribable! I get my hens (steamers) from the Chinese butcher shop who also sell bags of feet, necks and giblets. You will never go back to ‘chicken’ soup again! Hum!!! I thought a chicken and a hen were the same thing, what’s the difference? You can leave it out, no problem. Wow. what a simple recipe and it looks delish. I will be trying this soon, soon. I usually make chicken soup but more robust and hearty. However, my husband prefers this version, light and airy. I live in Toronto and yes it’s cold and this will def. warm him up. I will add green cooking banana to this because he doesn’ t like the matzo balls. Personally, I don’t like chicken soup, because when I was small, the first thing they fed up was soup, and as an adult today, I associate soup with sickness, weird, I know. I need therapy. your recipes are so superior , at least for me, than all other sites i subscribe to. That makes me so happy. 🙂 Thanks for writing Jay! Hi Donna! You can try simmering some dark meat chicken pieces in a smaller soup pot just covered with water for a couple of hours to create a very rich stock, then add that richer stock to your soup base. Another trick I’ve used is to simmer some saffron (real saffron, it’s expensive and potent) in the stock. The saffron adds a nice dimension to the flavor and it also colors the stock golden. But for more rich flavor, I would go with the smaller pot of stock option. Good luck! Shalom, Joy to you for passover. How do recommend cleaning the chicken. Do all the guts etc come out. Can’t wait to try the recipe. Take out any “innards” before making the stock. You can include the neck in the stock if you want to, but the liver and other organ meats will make the broth cloudy. I’m going to try this recipe, but I’m a novice at cooking. Can dried spices be substituted for the parsley and dill and get the same result? Hi Jessica – the flavor will really be different using dried herbs. Honestly for best flavor I recommend fresh. Good luck! Delicious. This is perfect chicken soup, literally just like mom’s. Your instructions are clear and very easy to follow, and I’m glad you include skimming the foam – very important! Thank you. My Jewish mother-in-law used to make Matza Ball soup. I usually just buy Manischewitz Soup Mix Box type, which I like. I am going to try your receipe. With the cold weather here in MI and having a head cold. I really think this will be what the Dr. ordered. Thank you. I tried the chicken soup recipe and it was delish!! My husband loved it. My mom always made chicken soup for the holidays, and this is the first time I’ve actually made it myself. The recipe was easy to follow, and the broth was rich. I think the cloves add a wonderful warm and somewhat spicy element to the soup that we both enjoyed. I made it with noodles, but I will definitely try it again with the matzoh balls. Amazing soup! I usually but a mix but not anymore, thank you!!! Thanks, great comments……..I’m off to make my Mom some of that wonderful motza ball stuff. She has been under the weather for some time, and I don’t think anything will make her feel better. I am trying to access your recipe for Jewish Chicken Soup…but it was a specific entry where you talked about your mother and your Bubbe…you specifically mention making sure you start with the chicken in cold water…I am getting a message that that website is down. Can you send me that particular version of your recipe? Nancy, I’m not sure which entry you’re referring to. I don’t have a Bubbe, I’m a convert to Judaism 🙂 maybe you are talking about a different site? Also my site appears to be up right now, so if you’re having any issues please let me know. Am I correct in assuming the bay leaves go in with the rest of the veggies and spices? I don’t see it listed beyond the ingredients list. Yes it does – on this blog dry bay leaves are considered a “spice” or “herb” and can be counted among those ingredients in process instructions. I know you posted this a while ago, and I’ll be cooking this on Sunday, but I have a couple questions I hoped you might be able to answer. 1. 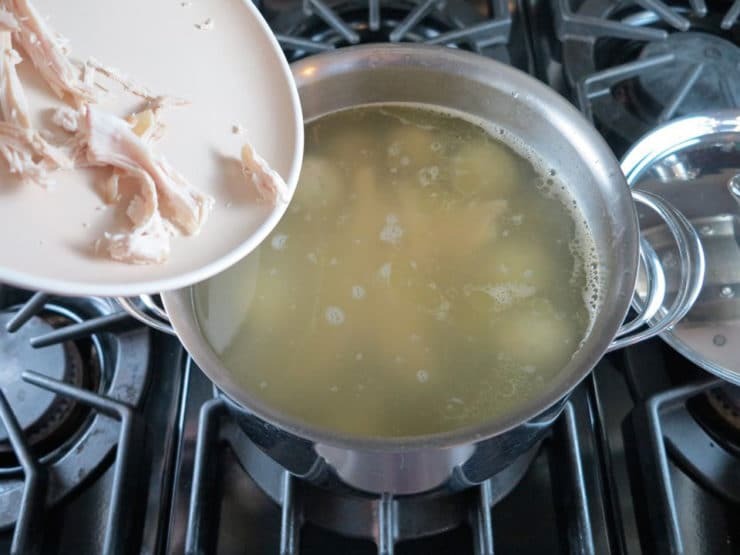 I picked your recipe because it seemed the best, but I’ve seen other recipes that use pre-made chicken stock and 3 pounds of chicken cooked in it to make the broth. I love A LOT of flavor, but is that overkill or does it screw with your recipe? 2. I’m making this with your floater matzo ball recipe. I’d like to make it with schmaltz, but I’m not sure how to procure chicken skin and fat. Will there be sufficient skin and fat from the chicken I use to make this broth or is there another way I should be getting that? It’s below zero today in Maine and I feel a cold coming on. I’m punching out early but not before I stop at the store for a chicken to make your chicken soup recipe. I usually wing it but your wonderful words have inspired me. thanks in advance! My mom passed away in 2011. She used to make the most wonderful chicken noodle soup and I have been trying to copy it ever since without any luck. Today I followed your recipe and feel that mom had a hand in the kitchen. With many thanks I am very grateful. this is really REALLY good chicken soup. I’ve always just put in a little of this, a little of that, and then a little more of this….but this one was simple, efficient and incredibly tasty! I admit, I didn’t include the peppercorns or cloves (my taste has no sense of adventure) but I am definitely holding on to this one. Thank you for such great directions! I love this recipe ! It takes me back to a place when you had your first bowl of perfect matza ball soup !! I add parsnip to the mix ov veggies (just because it’s tradition) ! Many thanks for amazing recipes !!!!!!! My grandmother died unexpectedly when I was 8. My mum never bothered learning her chicken soup recipe as we’d just go visit whenever she was craving the soup and so her recipe died with her. The taste of her soup has always stayed with me and over my adult years I’ve tried with no avail to match it. I’ve just tasted your recipe and its the closest I’ve got. All these memories came back. I think its the cloves which was a new addition. I was a bit scared of making it too strong so went easy on the cloves and pepper and so I had to add a little stock at the end. Next time I’ll be braver and follow your recipe to the t. Thanks for bring back a little but of my Grandma back into my house after 30 years! I grew up eating Matza Ball soup all my life, and my dad would call it ‘Jewish penicillin’ too. That’s what caught my attention as I was searching for this recipe online. Thanks for posting this! I lost my Mom’s chicken soup recipe and have tried literally 10’s of recipes, attempting to find one similar, yours finally hit the target. Jay that makes me so happy! Thanks for writing, and happy Passover! 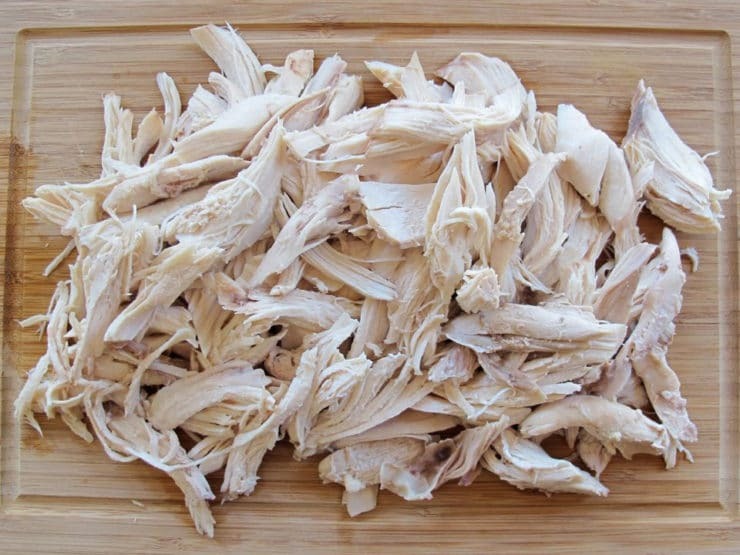 1)	The soup recipe shows the easy way to boil a chicken for any reason (e.g., chicken salad, chicken hash, etc.) 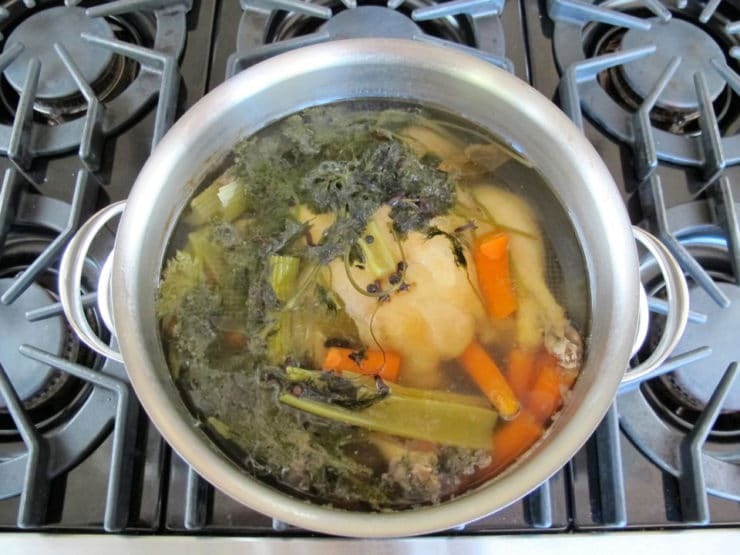 and make a delicious and nutritious stock without the need to reserve chicken carcasses. My preferred way is similar but simpler, consisting of throwing the chicken in the pot, covering it with water, adding the mirepoix, bringing to a boil, turning off the heat and then letting it sit covered for 45 minutes or until done, taking out chicken, reserving the broth as stated in the recipe, etc. I used to boil down the stock in half for a richer flavor, but my family doesn’t like it as much as the “thinner” version. 2)	You can always throw in the peel of an onion to darken the stock, but that is a matter of personal preference and entirely unnecessary. 3)	Using the baking powder in the “floater” recipe is easy and eliminates other methods of making floaters that take more time and don’t taste any better. 4)	The seasonings are fine as is. 5)	Matza is flavorless, but important for the obvious reasons. Making it taste good creates family traditions. 6)	Avey’s recipes are winners. It is the consistency of what is published that keeps me coming back to this site. Matzo ball soup is always the most favorite and requested Passover dish at my house. So I would say yes, it’s a good idea to double it! BEST soup I have ever made. The cloves made the difference for me. So Happy !! Thank you. I’ve used your matza ball recipe many times before and it’s truly the best!! Thank you for sharing. That makes me so happy Jhennia-Jane Solovyov! You have made many of my guests for Shabbat even happier? thank you! Taking out the scum can get tedious – so I decided to try using a paper towel, sorted of rolled up. It seemed to work for me! As I used the end of the ‘roll’ I rolled the end up and continued – until the scum was gone. Just be careful not to accidentally dip your fingers into the hot broth. I have made this delicious soup several times, as far as removing the scum and fat, I remove everything from the slow cooker (6 hours cooking while at work) and pour the broth into another pot and refrigerate. The following day, I remove everything that’s floating on top with a spoon. Fats have solidified, then I place the chicken and other vegetables back in; it’s still very flavorful and it has less fat-healthy! Hi, quick question for you. I have thighs and legs in my freezer. will there be a big differnce if I dont use a whole chicken or that I am defrosting chicken? I love this soup! I thought the cloves would make it to strong but it was perfect. This is a recipe I will add to my favorites. Can you make chicken soup with just thighs and legs? Will it come out OK without the white meat? I’m only making a small amount and don’t want to buy a whole entire chicken. Yes it will turn out great, as long as you use the same amount of meat pound for pound. If you’re using less meat, cut the other ingredients accordingly (especially liquid) otherwise you’ll end up with a bland broth. Hi Jane, probably your best bet is to make multiple batches of stock separately from the matzo balls. You can make the stock ahead and freeze it, then thaw/reheat the day of the meal. Make a large pot of stock just for the matzo balls for best flavor. I always err on the side of making more than you think you need, some people end up making a meal of the soup alone because they love it so much. Hope that helps! Wow! Thanks so much for the quick response. I just made it for my family and it was a big hit! Thanks again! I can’t wait to make this soup, looks delicious! I’m new to making soup stocks, am I supposed to throw out the bag of giblets or cook them with the chicken? Thanks for your help! Soup was delish, my matzo balls exploded though so it was just plain chicken soup for me! Lovely richly flavored broth. If I had to change anything I’d actually just add cracked pepper because I couldn’t taste any despite adding a whole tbsp of peppercorns! My pregnant daughter had a craving for a great Matzo Ball Soup and this was so perfect that it made her cry. I did end up adding extra salt and dill at the end for I too love dill. Thank you for the posting a and I love your blog!! So great to hear that Tina! Congrats on your daughter’s pregnancy! I am making chicken soup for myself to enjoy after my surgery and I return home from the hospital. I noticed in the blogs that you can freeze the broth, is it possible to freeze the chicken, carrots, onion and celery in the broth? Thanks. Hi Sandy– absolutely. You may want to undercook the vegetables just a bit, as they soften upon reheating. No big deal, they’ll just be tender, but if you want them more hearty/solid you may not cook them quite as soft before freezing. Enjoy, and wishing you a speedy recovery! I’ve frozen chicken soup many times, and it is just OK. The vegetables, already soft from cooking, will end up even mushier after thawing. What I would suggest, if you want to freeze the soup, is to serve the already cooked vegetables as a side dish, and freeze only the broth. Then, when you thaw it, you can slice up new celery and carrots and boil in the broth until tender…about 15 minutes. You’ll end up with what tastes like fresh-made soup, with vegetable that are tender, without being mush. I’ll make some today. Can’t wait! I have made your recipe several times now…it is so good! It is a fun recipe to play with…adding different vegetables, using egg noodles, matzo or both! Thank you for sharing this! Thank you so much for your wonderful website and for all your wonderful recipes. Question: I am shopping for a large stock pot – do you have a particular brand or material (stainless steel, aluminum core, etc) that you prefer or would recommend? Hi Joy! I don’t have a particular brand to recommend. Mine is All Clad but it was expensive, and I honestly think you don’t need to spend so much on a stock pot. I bought mine because it had a wire mesh insert, which seemed like a good idea at the time (makes straining soup easier), but over time it’s proven a real pain to clean… the herbs and veggies get stuck in those little mesh grates. As long as you get a solid stainless steel pan you’ll be in good shape. I also recommend buying a large stock pot, especially if you entertain or have family dinners often… to get a great stock you need to simmer it for a long time to reduce it, which means starting off with a lot of liquid to get a descent amount of stock in the end. Think big. Hope that helps! and we sit at the table. Great to hear that Melissa! 🙂 Especially happy that picky toddler liked it too. I love your blog and reading about the history of food. Your step by step instructions and pictures make it so easy to follow. This is a great chicken soup recipe and very similar to mine, which was handed down from my grandmother to my father to me. We add parsnip, whole, and lift it out when the soup is finished. I am a floating matzoh ball lover and use seltzer for lightness and a good pinch of nutmeg for flavor–that was my bubbeh’s secret ingredient! 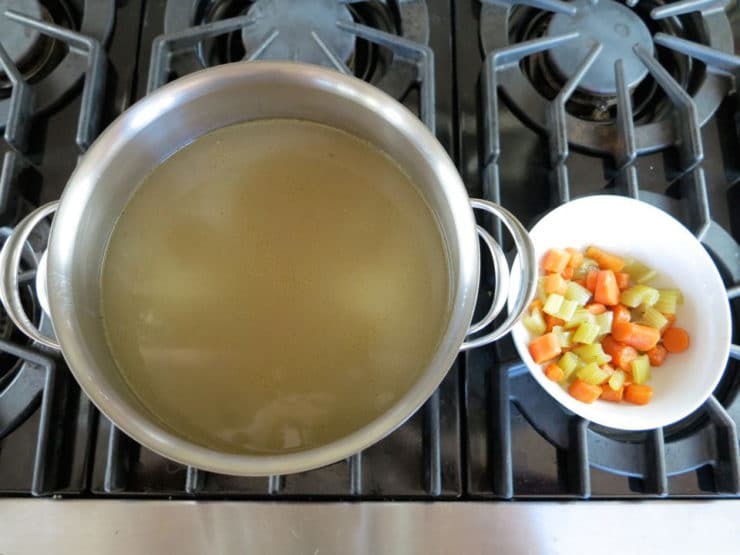 My wife makes a great chicken and matzah ball penicillin soup – I like to add small pieces of boiled potato to it and with carrot and celery it is meal on its own. My grand children called it ball soup…we all love it….. The best remedy ever ! I need a sweetie to make me this. Oh yeah! That’s the real stuff!